A photo essay of the last prototype PRR I1s in existence, #4483, currently being restored by the Western New York Railway Historical Society (WNYRWS) in Buffalo, NY. This .pdf document runs from one end of the locomotive to the other, going over every appliance and pipe, describing what it is and providing guidance for modelers. Many photos included! This is about a 1.7MB pdf file. 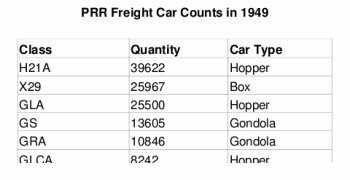 A complete listing of every class, type of car and roadnumber of every freight car still on the PRR roster in 1953 and 1958. 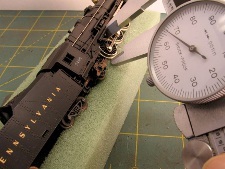 This is a very very valuable tool if you want to portray a realistic mix, for example, of boxcars, tank cars, flat cars, etc. This is a 167KB pdf file. Counts of each class of PRR freight car in these two years. The document also shows totals by car type. This is about a 210KB pdf file.